TAUNTON, Mass. 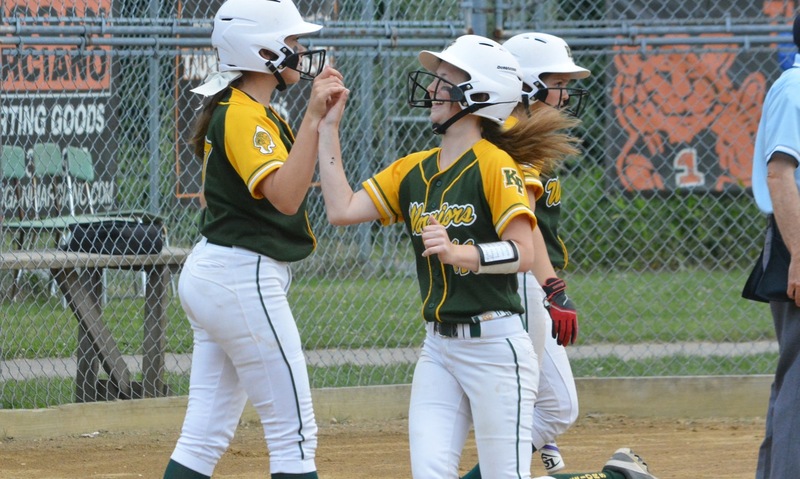 – King Philip has had no problem scoring runs all season, so after their bats were silenced for three innings, the sense was that an offensive explosion was coming. After Meghan Duffy doubled and scored on a sacrifice squeeze in the second inning to give the Wamps a 1-0 lead, the Warriors plated six runs in the fourth inning to take the lead for good, on their way to a 9-3 win in Wednesday night’s Div. 1 South semifinal at Jack Tripp Field. The fourth inning rally started with back-to-back singles, then a misplayed ball loaded the bases for the Warriors. Catcher Brianna Lacy laced a one out single, driving in two runs and opening up King Philip’s first lead of the afternoon. The runs didn’t stop there, as Sydney Phillips scored Lacy two batters later through a sacrifice fly. After another error scored Phillips, Meghan Gorman ripped a single to score two more for the Warriors. After surrendering six runs in the fourth, the Wamps continued to fight back, but the Warriors had an answer every time. 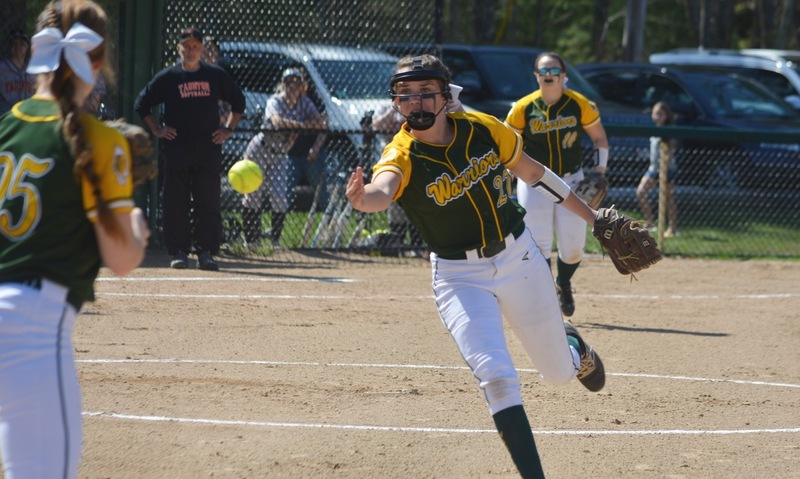 In the fifth, Kara Paquin’s RBI double gave the Wamps life, but King Philip answered with two runs of their own after three consecutive singles. Braintree again added a run in the sixth looking to get back into the game, but King Philip matched them yet again after scoring on a pass ball. The offensive outburst was due to the same approach they’ve followed all year: being aggressive. The Warriors had seven stolen bases and laid down two bunts, both part of the six-run fourth inning. For as good as King Philip’s offense was, starting pitcher Elise Pereira was very economical on the mound. The right-handed senior threw an 89-pitch (71 for strikes) complete game for the Warriors. Pereira was able to limit the Wamps damage all game, including ending the Wamps second inning rally with back-to-back strikeouts. King Philip (21-3) advances to take on league rival Taunton in the Division 1 South Finals on Friday night at 7:00 back at Jack Tripp Field. 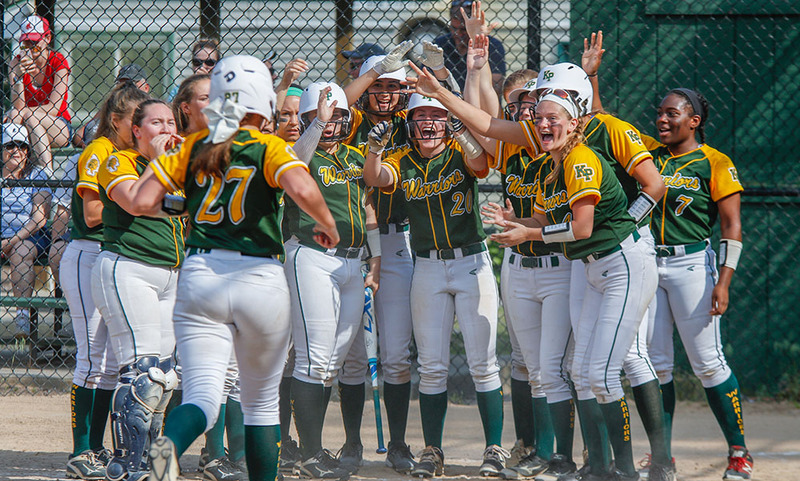 When the pitch hit Bri Lacy’s glove, the King Philip players and fans leapt to their feet in celebration only for it to be called a check swing. 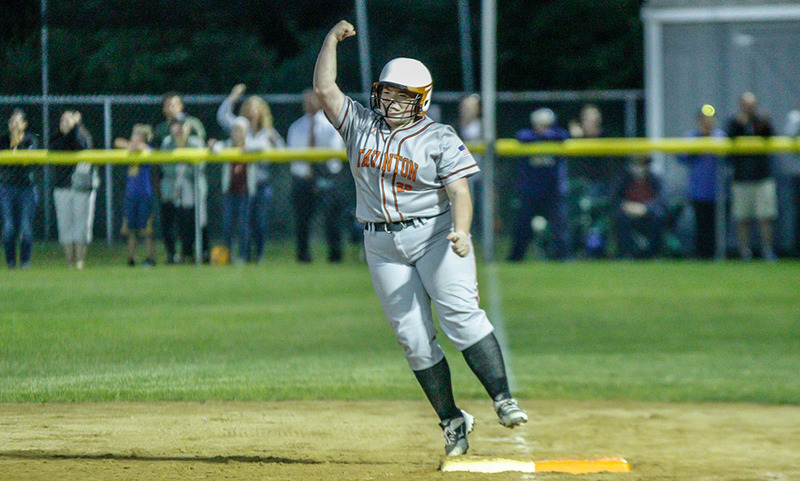 The game continued, but unlike in the seventh when Bishop Feehan rallied for a tying run that forced extra innings, Elise Pereira reached back for a little extra on the next pitch and this time there was no doubt. The strikeout, only the third of the game for KP pitchers and first of the game for Pereira, sealed an 8-7, eight-inning, two-hour and 15-minute marathon win for the Warriors in a Div. 1 South first round contest that had enough twists, turns, comebacks, and game-winning plays for an entire playoff run. KP needed plenty of resiliency to pull out the win and avoid a three-game sweep against the Shamrocks (who won 10-5 and 7-5 in the regular season). The Warriors led 7-6 with two outs in the bottom of the seventh, but a bad bounce put a Feehan runner on with an infield single. The pinch runner stole second but Pereira appeared to end the game with a nasty changeup only to have the umpire keep his arm fixed to his side. A couple pitches later, Jess Levesque lined a single to center to tie it. Feehan’s comeback was short-lived, as the bottom of the KP order sparked a rally in the top of the eighth. With one out, Lacy was hit by a pitch, Sydney Phillips dropped down a perfect bunt single and Meg Gorman was hit by Feehan pitcher Sarah Magro. 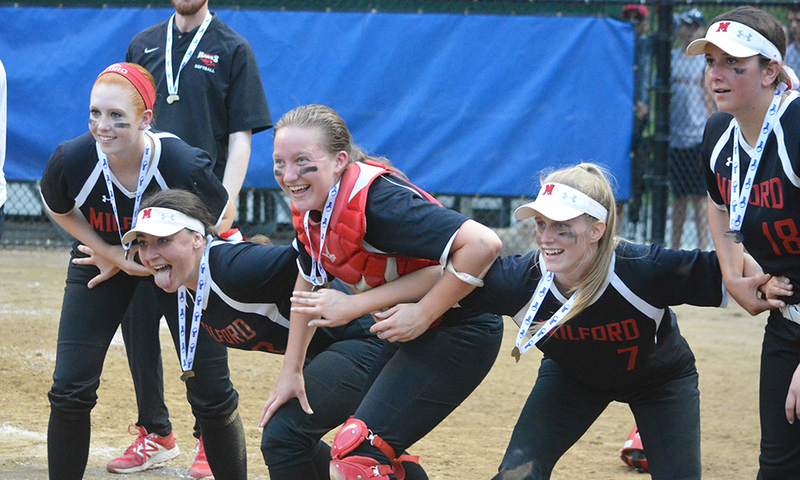 Hailey McCasland chopped a bouncing ball to short with the bases loaded that was not fielded cleanly and gave the Warriors a one-run edge. In order to beat the Shamrocks, KP needed everyone in the lineup to contribute at one point or another. It started in the first with Gorman beating out a double to open the game. Nicole Carter was hit by a pitch with the bases loaded to plate the first run and Brooke Taute brought in two more with a single to center. Jenn Hutnyan threw a clean first inning and then helped her own cause with an RBI single to bring in Gorman in the second for a 4-0 lead. Feehan fought back with two homers in the next two innings, including a solo shot by Julia DaCosta that tied the game at 4-4. In the fourth, KP regained the lead when Gorman singled and then stole second. 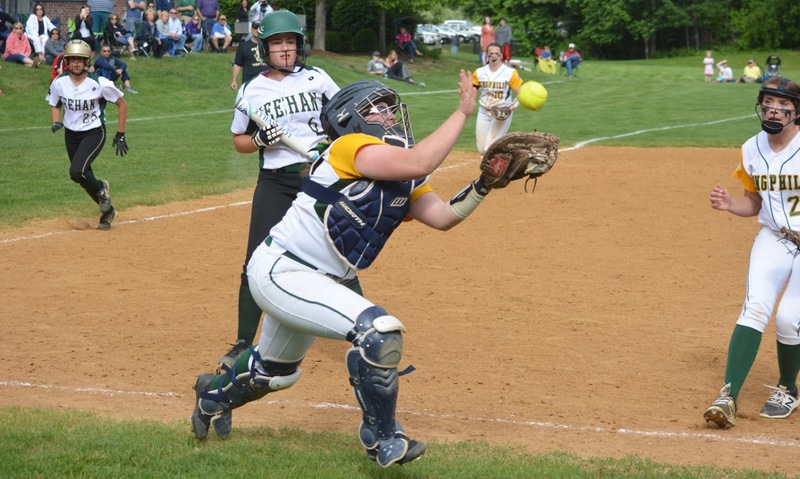 With McCasland at the plate, the Feehan defense was aligned so that the centerfielder was forced to cover the steal. The ball got through and Gorman raced all the way home. Again, Feehan battled right back. A pair of singles and a sacrifice bunt put two in scoring position with two outs for DaCosta and Beauchemin made the decision to intentionally walk the Shamrocks power hitter. Magro followed with an unintentional walk to tie it and then a wild pitch gave the Shamrocks their only lead of the game at 6-5. Pereira took over and got a line drive to Phillips in center to end the inning. There was no quit in the Warriors. KP rallied for two more in the next frame. Pereira battled for a lead off walk and Jess Bonner dropped a bloop down the right-field line. 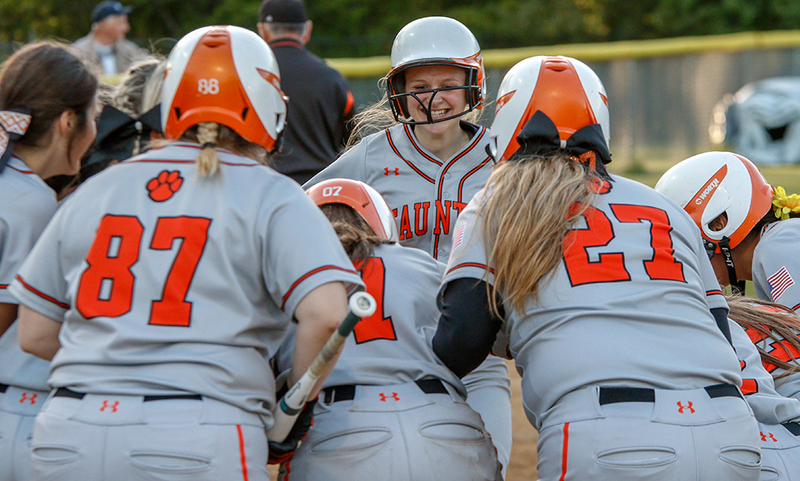 Carter picked up her second RBI with a base hit to right and Lacy drove in the go-ahead run with an RBI-groundout. The drama continued in the bottom of the fifth when Feehan loaded the bases for DaCosta with two outs. 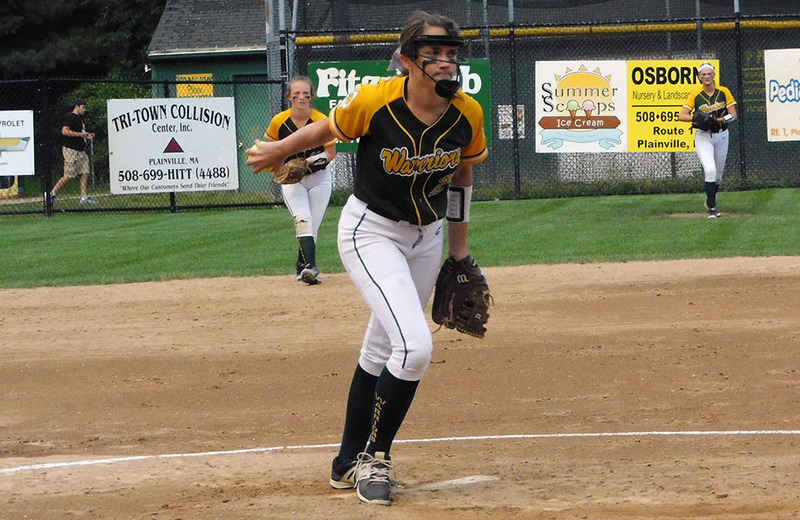 She swung at the first pitch and popped it up off the end of the bat and Lacy was quickly out from behind the plate to make a sliding catch that got the Warriors out of the jam. “Everybody has to be in the game because the ball always finds the person who’s not. It’s huge and everyone was hitting,” said Pereira. When the final out was finally recorded, gloves and arms flew into the air. It felt like a game that could have been played in the sectional final rather than the first round and the players, many of whom were important contributors on a state title team last spring, reacted like it was a final. King Philip (18-6) will have a quick turnaround, traveling to Kingston to take on the Lakers on Sunday at 2 p.m.